A pair of 1900 era music, paper or collector file cabinet are solid oak and also fit wine bottles. 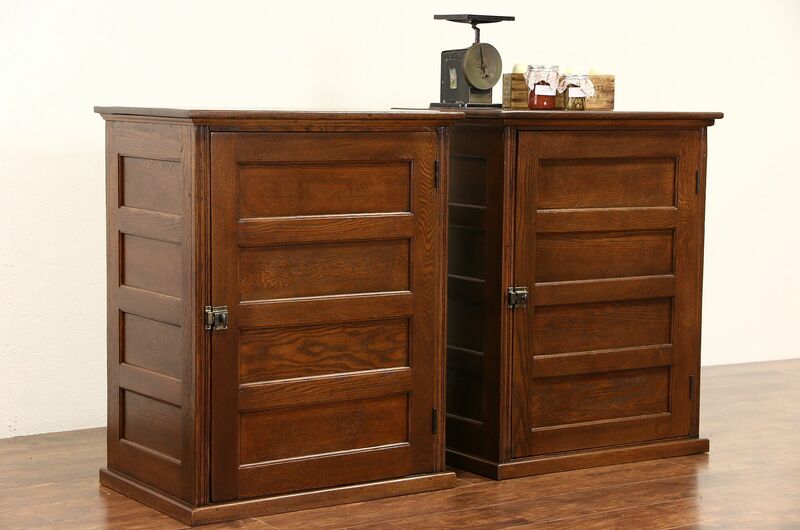 The restored finish is in excellent condition on this American made antique office or library furniture. There is a loss under the top on the right side of one cabinet, see photos. Panels are reverse raised, latches are original. Each cabinet has 16 compartments with interior size 12" wide, 17" deep and 3 3/4" high. Overall size is 30 1/2" wide, 21" deep and 38" tall. See 26 photos on Harp Gallery website that enlarge to full screen size.